The vertical exaggeration factor of the digital terrain model in this video is 2.5. The European Mars Express mission was launched from Baikonur Cosmodrome on 2 June 2003. The High Resolution Stereo Camera (HRSC) on board the spacecraft has enabled planetary researchers to view Mars in three dimensions. The Institute of Planetary Research at the German Aerospace Center (Deutsches Zentrum für Luft- und Raumfahrt; DLR) developed and is operating the camera. Credit: ESA/DLR/FU Berlin (G. Neukum). Grabens, dendritic valleys, lava flows and the highest known mountain in the Solar System – in the images from the German stereo camera on board the Mars Express spacecraft, the topography of the Red Planet appears so three-dimensional that you could walk through it. "For the first time, we can see Mars spatially – in three dimensions," says Ralf Jaumann, project manager for the mission at the German Aerospace Center (Deutsches Zentrum für Luft- und Raumfahrt; DLR). The spacecraft with the camera on board was launched on 2 June 2003. Since its arrival at Mars six-and-a-half months later, it has orbited the planet almost 12,000 times and provided scientists with unprecedented images. It has been used to gradually create a 3D image of Mars, enabling the planetary researchers to acquire new and surprising information about the climate and development of the Red Planet. The High Resolution Stereo Camera (HRSC) – one of the most important instruments on the spacecraft – was pointed towards Earth while en route to Mars, providing the first evidence that it had survived the launch from Baikonur Cosmodrome. The camera took a test image of Earth and the Moon on 3 July 2003, from a distance of almost eight million kilometres. This was met with great relief at the DLR Institute of Planetary Research, which developed and is operating the camera. The next image was taken when the probe was still just 5.5 million kilometres from the Red Planet. The various features were visible as light and dark areas, and the ice cap at the South Pole appeared bright white. Mars Express reached its destination on 25 December 2003 – and caused an initial shock. The HRSC took its first close look down towards Mars and sent back an almost plain white image. "Everyone just swallowed," recalls Ralf Jaumann. Was the camera designed for use in space not working? The failure of the instrument would have been a bitter disappointment for the scientists. But one of the nine different channels of the camera – the infrared channel – was still showing weak contours of the surface of Mars. The solution to the problem was quickly found; the sensitivity of the camera close to Mars was much greater than that expected by the researchers, meaning that the first image was overexposed. Two Mars orbits later, on 10 January 2004, and with the correct exposure time, the first of many successful images was acquired from an altitude of 277 kilometres. A section of the southern highlands near Isidis Planitia was revealed in detail. Since then an almost complete 3D global view of the Red Planet has been created from the numerous images. The scientists put the camera images together piece by piece like a jigsaw puzzle, creating a global map of Mars. Of the 145 million square kilometres of the surface of Mars, 97 million have already been covered at very high resolution, where one pixel corresponds to less than 20 metres on the surface. Almost the entire surface of Mars has now been imaged at a resolution of better than 100 metres. Atmospheric features such as clouds, haze or the dreaded dust devils – Martian whirlwinds – make the occasional image unusable, creating a gap that is filled on one of the following flybys. "This has enabled the creation of the most comprehensive data set that has ever been acquired by a German instrument designed to study our Solar System," says Jaumann. This information is being combined with data sets from other missions, such as Mars Global Surveyor or data from other instruments on the Mars Express spacecraft. The 3D view of the valleys, canyons and lava flows is possible because of the unusual imaging principle used by the camera. Nine light-sensitive detectors sweep the surface in sequence from nine different observation angles. This data is then processed into three-dimensional images by the DLR planetary researchers. "We can see the entire topography almost as well as if we were standing on Mars ourselves," says Jaumann. What is the angle of inclination of a slope? How thick is that lava layer? 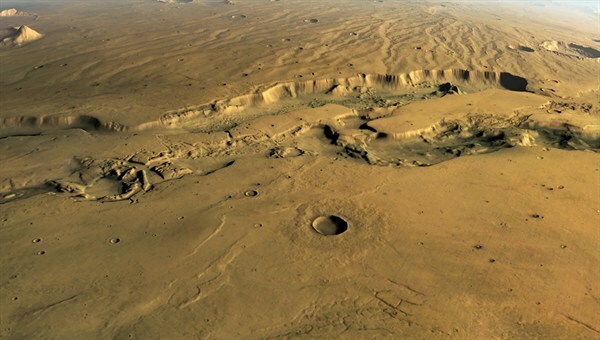 Using the images from the Mars Express camera, the scientists have been able to determine, for example, that volcanism on Mars was still occurring relatively recently. Some of the shield volcanoes in the Tharsis region of Mars were still active a few million years ago. In geological terms, that is still in the planet's recent past. Even today, the volcanoes may just be taking a break from this former activity. But the images from the High Resolution Stereo Camera have revealed even more to the planetary researchers. Although the conditions on Mars are no longer suitable for the existence of liquid water, at some time in its past water must have flowed over its surface, scouring out deep valleys in the highlands and creating huge outflow valleys three to four billion years ago. Using the camera's super resolution channel, images can be acquired that are so rich in detail that geological processes in which water was involved can be seen. It is likely that there were periods of flowing and standing water during the history of this planet, which is so dry and dusty today. This means that different climatic conditions must have been predominant in the planet’s early history. This is also clearly visible in the three-dimensional camera images showing structures near the equator that have been caused by glaciation. This is not compatible with the climate on the Red Planet today. Why has Mars changed so much? What are Mars and Earth so different? And did Mars have conditions suitable for life in its past? The Mars Express spacecraft and HRSC camera are continuing to supply data to help answer such questions. "The Mars Express mission was due to end after one Mars year – or about two Earth years," recalls Jaumann. But during the past 10 years the European Space Agency (ESA) has kept extending the mission. The spacecraft is now due to continue orbiting Mars until the end of 2014. "That is actually the bottom line on the past 10 years; everything is still functioning perfectly and we are still acquiring new data that is important for Mars research."